Last month I confessed my fear of yeast bread, but after a somewhat successful attempt at Rum Raisin Bread – I gained a little confidence and before long, I was a yeast bread making machine. Amber encouraged me to broaden my yeast skills and graciously put together a list of her must-have bread making tools. Coincidentally, King Arthur Flour released a free shipping code the following day. It was fate – fate I tell ya. I put everything that Amber recommend into my KAF cart (see below for her list) and tossed in a 10 pound bag of flour because hey, free shipping is a good thing. While impatiently awaiting my KAF loot, I combed the web for yeast recipes – bookmarking too many to count, but I kept returning to this Cinnamon Swirl Bread from King Arthur Flour. I am a lover of all things cinnamon – well, except fake cinnamon like Big Red Gum, that kind of cinnamon makes me cough something fierce. This bread is pretty simple to make – so simple in fact that I made it two days in a row and let Brian’s daughter do most of the work. We didn’t roll our first loaf tight enough, so it had a couple of gaps within the swirls, but it was incredibly tasty. The following morning we sliced it up super thick and made the most delicious French Toast ever. Serving it alongside some thick cut bacon made for an incredible Sunday morning feast. By now you may have skimmed down to find the recipe – but it’s not here. I really didn’t change one thing about the KAF recipe AND they have step by step photos and if you’re at all like me – you need all the help you get! For these reasons, I thought it was best to link you directly to their recipe. Plus, I figured you’d be heading to their site to check out the goods on Amber’s Must-Have List! You can thank Amber later for your newly developed KAF addiction! All in all my yeast fear is quickly fading and I can’t wait to share some of my other yeast successes with you. Do you have a fear of yeast baking? How about we go on this journey together? Surf on over to the King Arthur Flour site and pick a recipe or print this one. I’d love to hear about your experiences making it in the comments. King Arthur Flour bakers use this yeast in their bakery on location in Norwich, VT. I was personally told by several of the bakers that it is the best they’ve found. Dry milk from the grocery store is just fine for yeast baking. But if you aren’t quite getting the rise out of your bread that you expected, or the tastiness, give the specially formulated KAF dry milk a shot. They had it created just to their specifications, for their bakers. When I visited KAF, they showed me a loaf baked with it and without it, and the loaf with it definitely rose higher and looked prettier. At the King Arthur Flour Baking Education Center, they use these little dough scrapers for *everything* from mixing dough by hand to scraping down kneading surfaces to slicing dough into desired sizes. I’ve found myself using it at home constantly, and not just for bread baking. It’s a cheap “food mover” from my island to my stovetop, and it cleans the heck out of sauces that dried and stuck to my countertop without a ton of elbow grease. You may look at this item and go, “What the..”, but as the KAF Bakers told us at the BEC, just try it. It mixes dough well, and easily, without a lot of exertion. Plus, when you’re working dough by hand or with wooden spoon, you can have a tendency to overmix because it takes so much work to get it through the thick dough. This tool prevents that. Something I didn’t know before attending classes at King Arthur Flour – dry ingredients and wet ingredients should not be measured in the same containers. Metal measuring cups are for dry ingredients. These beakers are for wet. They are lightweight, easy to clean, easy to see measurements in all sorts of increments, and incredibly accurate. So much of baking is science, and you’ll have a better result if you’re accurate from the start. What perfect timing! I make home-made bread every week and today I was going to attempt Cinnamon Raisin Bread. I was even going to look up a recipe at King Arthur Flour, then at the last minute decided just to make three loaves of my regular white. Now, after reading your post today, tomorrow I am going to make this bread. I’m hoping it comes out as lovely as yours looks because I’m really craving for Cinnamon Raisin toast! I shy away from yeast baking myself, but I have to say that your bread is BEAUTIFUL – the swirls are perfect. Bread like this is dangerous for me. I could seriously eat the whole loaf myself. It’s beautiful! Love that first photo Jamie! I want some of this for breakfast tomorrow! I love cinnamon swirl bread. This is a great list, thanks for sharing. Your bread looks divine! I have only baked with yeast like two times in my life. I’m not really sure if I find it intimidating because I usually am so careful when it comes to the temperature, but then again I might have just been lucky those few times. Anyways, I love the look of your cinnamon swirl bread! Cinnamon swirl bread is one of my favorites! Thanks for the list, Amber! I can’t wait to give this a try. Love cinnamon bread. Thanks so much for posting, now off to King Arthur. What is instant mashed potato flakes? 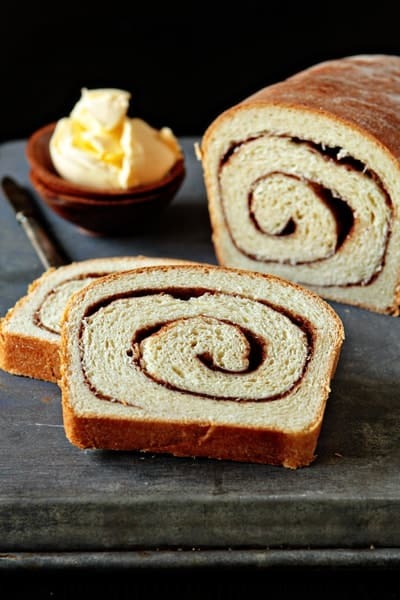 Oh my gosh I’ve been wanting to make a homemade cinnamon swirl bread… that look SO good!!! Simply awesome..how neat are the slices! Love it..love it.. 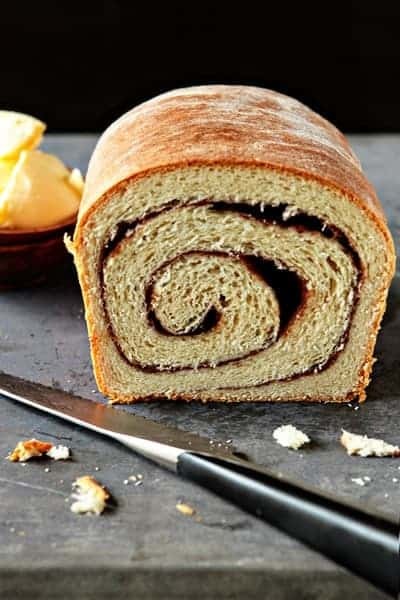 This bread looks delicious and your swirls are perfect! What a beautiful bread! I love cinnamon bread so I will have to give this a try. I, too, am getting over my fear of yeast breads! What a perfect swirl. Looks fabulous! I’ve been wanting to make this for a while! It looks delightful. Gorgeous! I do have a fear of yeast baking–looks like I need to go shopping first! So glad you are conquering your fear of yeast!! KAF is my favorite site to go to for all kinds of bread recipes and I have all the must have items listed about except for the beaker because I already have a nice liquid measuring cup. The other must have item for bread baking is a scale. I use mine all the time & it cuts down on the number of dirty dishes that I mess up! Most all of the KAF recipes provide measurements in ounces too so it makes it super easy to use the scale. They have a PDF with all of the common ingredients used in baking that tells you the weight of certain measurements (i.e. 1 cup of powdered sugar = 4 ounces). I have a printed copy I keep in my cabinet where my baking ingredients are stored for easy reference. Enjoy the wonders & delicious taste of homemade bread! Beware though, you might have to make extra trips to the gym to counteract the extra calories! I totally agree with Debbie about a scale! It makes measuring so much easier and more accurate. And KAF posts all their recipes with both weights and volume measurements. The scale is perfect for making the no-knead bread recipes that are out there. I have made this cinnamon swirl bread from KAF before and it’s amazingly good!! Confession: I’ve never even heard of dry milk. Oh boy – I have a lot of learning to do! Your bread looks so delish. One of my first yeast recipes was a cinnamon swirl bread. It was delicious and my house smelled amazing. I’ll take a slice of that with a big ole slab of butter please! This bread looks beautiful! Love anything with cinnamon. Yum! I used to be the same way until I came across a recipe for a Provencal Style Herb and Cheese Bread that I had to try. It came out perfectly on the first try which gave me the confidence to make more, and now it feels like I’ve been making bread forever. And King Arthur is the bomb diggity! I too love everything that involves cinnamon and have been craving cinnamon buns for a week now, but this bread looks sooo good and it’s much more simple to make. I think I’ll give it a try. Oh, LOVELY. I have made this KAF recipe before (had the inevitable gap under my lid the first time, too) and it is spectacular. Yours looks perfect. And isn’t it neat how reliable yeast is? I actually have a harder time with quick breads than I do with yeast breads, which you can pretty much beat the crap out of and still get a yummy loaf. Well done! Another kitchen accomplishment to check off the list! Looks excellent, cinnamon is my favorite this time of year. Well, that and pumpkin… it’s a close tie. This has got to be the most beautiful loaf of bread I’ve ever seen! It looks absolutely heavenly!! Oh so pretty! 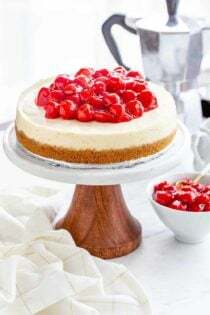 Delicious-looking too. Probably my most favorite bread in the world!